This two-tier banded stripe necklace is made from hand-turned, graduated disk beads of jet and Kingman turquoise. With each passing year, fewer and fewer people at Santo Domingo Pueblo make handmade beads. Fewer yet still make handmade beads of jet because of the black dust created in the process of making the beads. Lupe Lovato persists in his traditional beadmaking and he is one of the very best beadmakers at Santo Domingo. This necklace is also a fine example of the patterned banded stripes so often used in Santo Domingo necklaces. 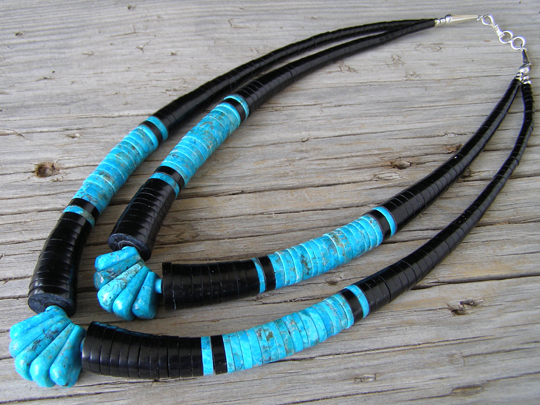 Five graduated tabs of Kingman turquoise hang from the center of each strand of the necklace. These tabs symbolize the corn crop which is so essential to the pueblo. This is finished with small round Sterling beads and Sterling cones at the catch.